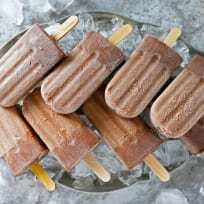 Chocolate bourbon popsicles are a wonderful adult way to cool off! 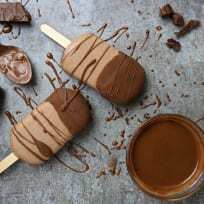 The extra chocolate dip makes them even better. 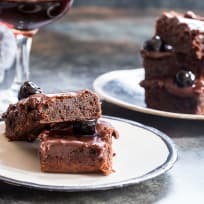 Manhattan cocktail brownies are here for your happy hour. Who can resist chocolate, cherries, and bourbon?! 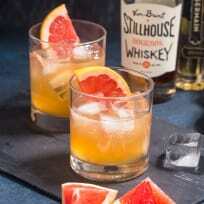 This grapefruit whiskey sour harnesses the best flavors of citrus season in an easy to drink cocktail for the ages. Don’t forget the grapefruit wedges for garnish! Spiked gingerbread bars are covered in a delectable bourbon vanilla glaze. They’re just the right thing for your grown-up holiday party! A cranberry cider mule is perfect for your cozy winter evening. Sip it by the fire! Bourbon brownie pumpkin pie is the best of chocolatey, pumpkin-y, boozy worlds! This is one dessert that will bring everyone together at Thanksgiving. There are any number of recipes one can make with bourbon. We've selected 24 of our favorites here. This bourbon grapefruit cocktail is a perfect combination of sweet, tart, fresh, and fruity! The refreshing blend of fresh-squeezed grapefruit juice and oaky bourbon makes it a great summer sipper. This strawberry rhubarb julep is spring-inspired, and entirely irresistible. You don’t need a fancy hat or a horse race to sip on it all season long!